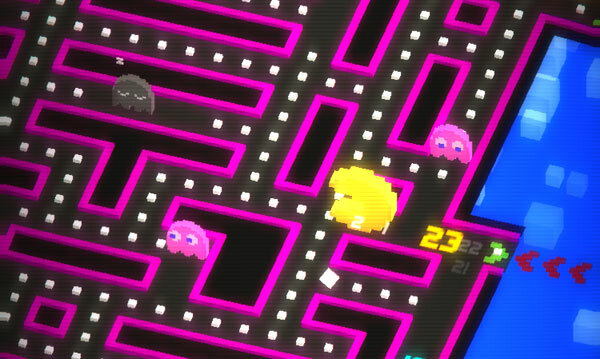 I think it’s fair to say that I’m rather dangerously obsessed with Hipster Whale’s Pac-Man 256. The one thing that playing it relentlessly has done has given me some insight into how to maximise your scoring possibilities. It’s worth pointing out that Pac-Man 256 is a randomised endless eater/runner, and as such there’s no such thing as a sure thing. Also, you’re going to die a lot, and sometimes in an unfair manner. Life, and Pac-Man 256 are like that. Here’s some quick tips to help you make the most of each game. Wacky powerups are nice, but the name of the game is scoring big points. Surviving for a good long time is satisfying, but it’s perfectly possible to have a lengthy game of Pac-Man 256 (which by its standards might only be a couple of minutes) and only score a few thousand points. In order to ‘win’ within that context, what you need to relentlessly focus on are point scoring opportunities. This means eating ghosts whenever you can, and chasing down fruit, not just for its own innate point value, but also that precious, precious score multiplier. You can’t “win” Pac-Man 256, but it’s possible to rack up reasonably solid scores simply by concentrating on keeping Pac-Man’s fruit intake high. 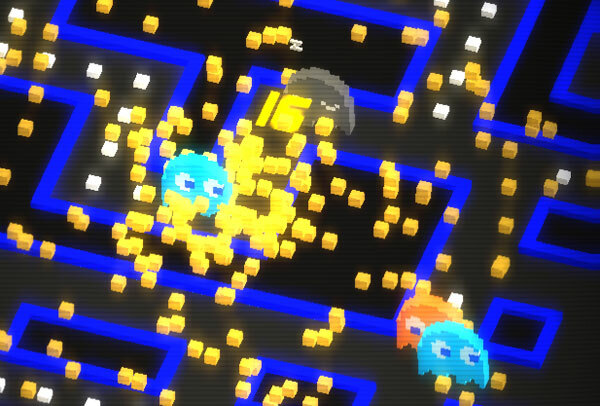 Pac-Man with frikkin’ laser beams coming out of his head is cool and all — but the classic power pellet is still his drug of choice. The new powerups are cool, and kind of funny the first few times you use them. The thing is, they’re nowhere near as powerful, or as high scoring as the classic power pill. Many of them either just allow you to dodge peril, or quickly destroy ghosts with minimal impact on your score. If you’ve got a choice between any powerup or the power pill, you should always head for the power pill. Why? Because the points stack, whereas most powerups are more about simple survival. Remember: It’s all about the points! That doesn’t mean the powerups are useless — if you can’t survive you can’t score points — but they’re definitely the second-best option if you have that choice. Get to know your ghosts. They certainly want to get to know you. 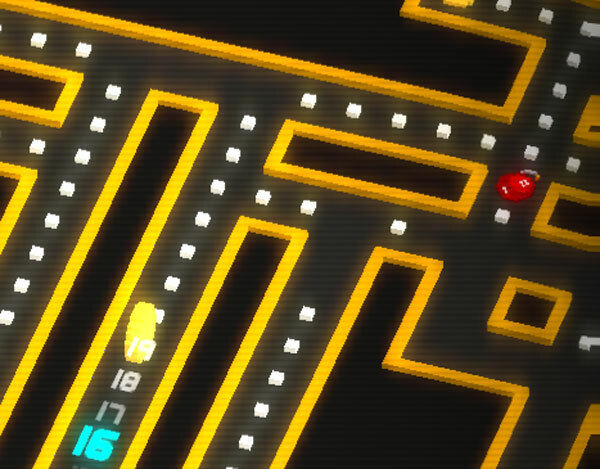 The randomised nature of Pac-Man 256 does make it tricky to succeed every time, but knowing the patterns of each ghost in the game makes a huge difference to your strategy. Only the Red Ghost (“Blinky”) actively chases you, and even then only for a while; ditto the grey sleeping ghost. 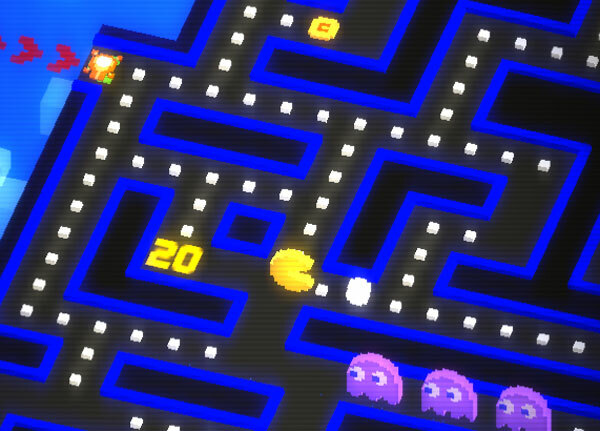 Every other ghost is quite predictable; orange ghosts turn at each corner, dark purple ghosts dash along straight lines only when they see Pac-Man, while groups of lighter purple ghosts try to track him from beneath. Blue Ghosts go around the block endlessly. Groups of green ghosts block the way, but they’re mostly just points waiting to be eaten. Glitchy Ghost is a teleporting pain in the backside. In all sorts of ways, this game would be much easier without the ghosts, but knowing the enemy gives you a big edge. I’m not certain if this is (gasp!) 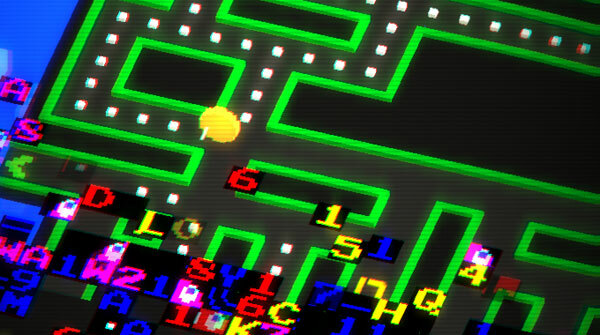 a glitch, or deliberate, but you should have noticed that amongst other metrics, Pac-Man 256 keeps your current cumulative single run pellet count tracking behind you until you double back or go over an empty pellet patch. Sometimes you can’t dodge that fate, except in one particular instance. If you approach a corner where there’s just a single pellet missing on the corner and swipe before the corner to move (pre-loading your movement, which you should be doing anyway), your pellet count will continue to add up. This doesn’t work if you’ve got a powerup or power pill active, but it’s otherwise a good way to keep that counter tracking upwards. I ain’t afraid of no glitch. Endless runners work on the principle that you can never go back, but, like Crossy Road, it’s feasible and often wise to backtrack a little, even if this means dancing around the edges of the game-ending glitch. 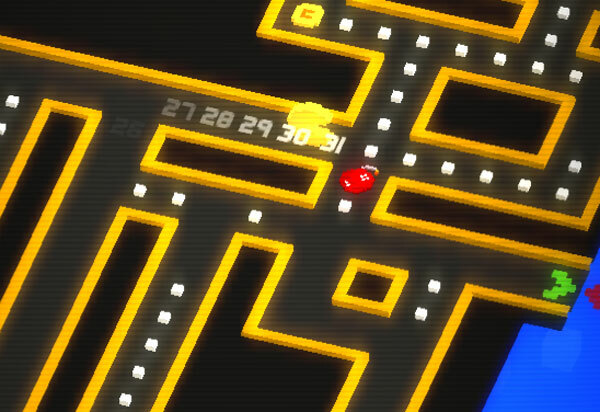 Indeed, Pac-Man 256 plays with the standards of endless runners in some interesting ways, because it’s also sometimes wise to simply stop on a corner and wait, especially if you’ve got a predictable ghost pattern emerging in front of you. Obviously you can’t wait too long, because the glitch will eventually get you, but simply moving forwards is often the least effective strategy.